Wow! What a joyful blessing! How marvelous! 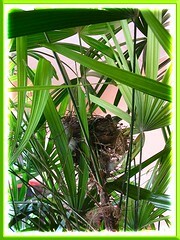 A bird’s nest in our garden! It had been a very long wait, probably about 16 years ago that we last had one on our Japanese Bamboo (Dracaena surculosa var. Punctulata) at our garden porch. Several nest-building attempts were made over the years, only to be abandoned quarter-way through. 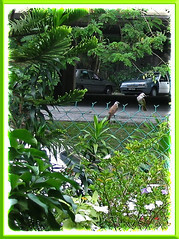 Right image above shows one of the bulbul birds that attempted to build a nest on the same palm tree a year ago. If I recall correctly, starting May 20th or 21st, a loving pair of White-browed Yellow-vented Bulbul was at it for about a week. I could hear their loud chattering or sort of love call to each other as they surveyed our garden for an appropriate spot to build their home. 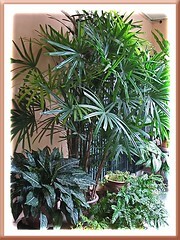 Our 8.5 feet tall ornamental Lady Palm bush was targeted. There were frequent flights in/out and I could see them carrying nest materials such as dried leaves or twigs with their beak as they paused briefly on our hanging pot of orchids. All their bustling outside, returning to build their nest bit by bit over the week kept me extremely excited as I watched from where I was working on my computer inside, facing outside. 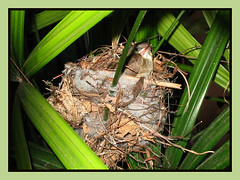 Their loose and bowl-shaped nest that is securely attached to the stems of the palm leaves is comprised of dry grasses, leaves, roots, twigs and vine stems. On the outside, it looked wishy-washy but inside…wow! Neat, tidy and beautifully lined, like a well-woven mini basket! Great ingenuity! This lovely pair is so alert and watchful, especially the female that is nesting. The male bird is seen less frequently, I wonder why? The sad thing is our palm tree is located way too close (about 2 meters) to our home entrance/exit and there’s definitely no way to avoid nearing it as we go about our gardening activities or in and out. Though we mean no harm, the female feels threatened, flying away whenever it sights us. 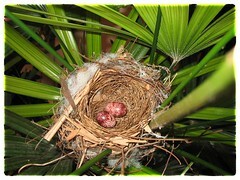 Fortunately, it is not deterred and will return to nest again and again. We really hope that it gets accustomed to our presence soon, settle down and breed well. Haha, even now, we’re unsure whether the female had laid any eggs yet, not daring to venture too close to see, lest it decides never to return at all. John says it is alright as long as we do not disturb or touch its nest, somehow it can sense if its nest is ‘man-handled’. BIRD’S EGGS! Wow! The female had laid two eggs, beautifully pink-colored with reddish-brown blotches. Well-done, pretty mum-to-be! Exact time of laying eggs is unknown…could probably had been about 9-10 days ago when the nest-building was completed around May 27th or 28th? Somehow, I had a strong conviction that the female had already laid her eggs. Firstly, she has been nesting on it most times. Probably both the would-be parents took turns in the incubation process, I just could not distinguish! Secondly, her lover comes visiting more often, and there were a lot of loud blabbering noises between them. Also, seen flying together happily around, as well as to the top of our TV aerial on the rooftop, singing in celebration of some sorts, I had presumed. What treasures and wonders to behold! Procreation, almost at our doorstep! So wonderful…these cute hatchlings joined our world yesterday, 9th. of June! There was a flurry of activity between the new parents, flying in and about, bringing food for their little ones…that’s how we knew the eggs were hatched! Safely tucked in the nest, 8.5 feet above ground from our preying eyes! 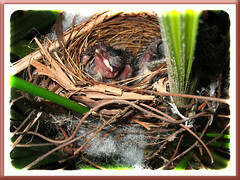 Did you observe that the house looked so clean…just hatched yesterday, yet no egg shells were seen in the nest? Parents must have cleaned up the mess, to provide comfort and safety…! How amazing! Parental love is simply marvelous! We’re terribly happy for the new parents – what a great success, two babies! Congrats, Mama and Papa! Well done! Today, the protective parents chased off a predator bird (not sure whether it was another bulbul or some other kind of bird) as it happened too fast for me to catch a good look. Heard some noisy commotion outside that sounded like the loud, incessant alarm call of the parents and by the time I ran towards the sliding glass door to get a peep, I was just in time to get a glimpse of the tail end of the harrowing incident. Nonetheless, the victorious parents returned immediately, hovering around and seemed agitated and restless for almost about half an hour. 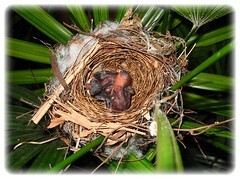 John says that the nestlings will be exposed to the many probable dangers within our garden compound too. Aargh!! Likely predators are the rats, squirrel, monkeys, garden fence lizards and cats that prowl around. Even other larger birds such as the crows, starlings and minors that perch or roost on the many large trees nearby pose a threat to these poor little sweet nestlings. I pray that everything will end well for them, that the parents will successfully raise their offsprings to fledglings unharmed. 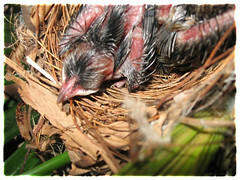 AT 8 DAYS OLD – ALMOST FULLY-FEATHERED NESTLINGS! SO CUTE! Wow! Amazing to behold them almost fully-feathered so soon! Just 3 days ago, they were ‘half-clothed’ as seen in above photos! The nestlings are getting stronger by the day, getting ample food from their parents. It is a wonderful feeling watching the parents bring food to feed the young. They fly in and out so frequently and it’s a joy seeing them from where I sit facing my iMac. Too bad, they don’t allow me to go near to have a glimpse of them actually feeding their brood, hence no captures of such to share here. The second I am sighted, the one brooding or feeding the babies would leave the nest and join its watchful and protective lover who had already stationed itself nearby, either on the White Mussaenda bush or hanging pots. Then together, they would make a lot of rattling sounds to show their displeasure! Anyway, I normally refrain myself from looking in too often so as not to fluster the parents unduly. Sometimes, I do wonder why this species of bird so often nest near human activities. Is it because they feel more secure? Yet, why are they so agitated when we’re around? I suppose it’s a natural protective trait inherent in parents, regardless whether human or animal! FLEDGLINGS ON THE 9TH DAY! WHAT A SURPRISE! I hadn’t realized that this is the day to bid them all farewell. Anyway since these nestlings were almost fully feathered, I prepared myself for this nest-leaving eventuality by surfing the net yesterday for some answers and read that fledging typically begins within 5 hours of sunrise and in most cases nestlings fledged before noon. I was not going to miss this one-in-a-million chance happening. Thus, this morning around 10 am, I took a seat behind the half-drawn curtains, slowly gulping down my breakfast mug of rolled oats and waited. It didn’t take long for the parents to announce their arrival with their usual bubbling chatter as they landed on the hanging pots of orchid canes. I sat immobile immediately and watched. The female (I assumed it was) flew in, perched close by the nest and made soft cooing sounds and movements as if beckoning the young nestlings to fly and imitate it. One hopped up onto the rim of the nest and stretched out its wings, one at a time. Then, it flew out of my view, probably nearby. I waited for the second nestling to do the same but nothing happened. Curious, I stepped out from where I was hiding. Too late…my sudden appearance triggered the parents to take flight immediately, as well as followed by the baby bird that had flown onto one of the hanging pots! All these happened within less than 10 minutes. Wow! So that’s how a baby bird is fledged, coaxed to imitate the parents! What an awesome event to witness. I was amazed of the fledgling’s instantaneous ability to fly! And so abrupt a departure that I felt its absence or loss immediately. What has happened to the other baby bird? Yesterday’s image also showed only one, where was the other? I hastily related to John about the whole event that I had just witnessed. He said that usually the whole brood will fledge and leave altogether with the parents, probably the other is…? Refusing to believe the worst had happened, I ran outside with the ladder. Its head was not showing. As the parents and its sibling were nowhere to be seen, I quickly climbed up to check. Thanks goodness, it was comfortably tucked inside, starring at me, looking a little off weather though. Brought my camera up-close to have a last capture before it flies away. Fly the baby bird did but just a few meters away, unlike its sibling that had flown away, guided by their parents. It allowed me a few snapshots, before it flew to our driveway aimlessly. Meanwhile, the parents had returned and perched above the high tension cables, watching but seemed to do nothing. Occasionally flying about but seem indecisive, probably the other fledgling needed their attention too. Ten minutes had passed, yet the little one was still motionless on our driveway, appearing so lost and exposed to harm. A wasp flew close by, I observed with fear. What if…? So, I approached nearer with the intention to put it back into its nest but the little birdie flew into our neighbour’s front yard which is void of any vegetation. Oh dear, what have I done? Seemed to be going from the frying pan into the fire – another short flight will lead it straight into a dog’s house in the next neighbour’s yard. I’ve no way of reaching it. Where are you, parents? Can’t you see your baby baking in the sun? Oh dear, I think they can’t see…another 15 minutes gone by! It stayed motionless at the same spot, not knowing to hop into the shade as we thought it would. Images of trapped rats dying in the heat of the sun flashed in my troubled mind. What should I do? I felt helpless! A humbling moment for me. “Lord Jesus, please help. My fault, I’m so sorry. Please, Jesus…help me”, I prayed fervently. Knock, knock! I called out to my neighbour from behind our backyard and requested her help to get the baby bird from her frontyard and pass it to me through the chain-link fence, separating us. Gotcha! A small squeak from the fledgling drew the parents’ attention hovering high above. That’s great. Oh, what a wonderful and thrilling feeling as I held the fledgling tenderly in my right palm (my first time ever), gently stroked it and returned it into the nest. It refused to stay put, instead flew down and landed at the bottom of the pot and stayed motionless and seemingly weak. Poor thing, must have been the sun stoke. All because of my carelessness, I felt so guilty. Ten minutes slowly passed before I lifted it up gently and brought it out in the open for the parents to view. Then, I purposely left it on a potted palm amongst other shaded plants in our garden, and quickly retreated inside our home out of sight. The parents flew in swiftly to take over – searching, pacifying and tending their baby with soft soothing noises, eventually feeding and strengthening it. I could hear and see most of their activities from inside, and was confident that everything will be alright from now on. Oh, I’m so happy and comforted at last! Rain poured in about an hour and a half later, but we were convinced of the parents’ expertise and know-how. 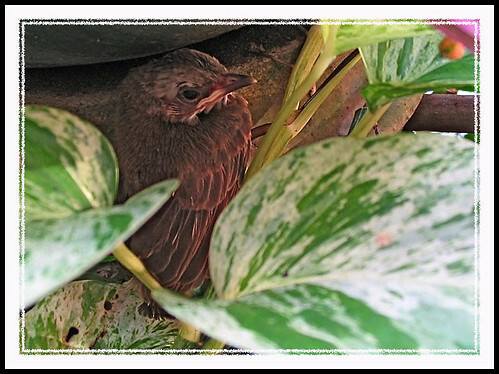 True enough, when the rain stopped, we peeped through our front entrance/exit door and saw that the fledgling was nestled cozily on our hanging pot of Spider Plants at our porch, sheltered from the rain. How smart they were to have coaxed their baby to fly to a safe destination, about 8 meters away from where I left their young. Amazing! When no more cooing or chattering noises were heard eventually, we knew that the parents have succeeded to fledge the second baby bird, around 4 pm. Almost 6 long hours for the second fledgling whereas the first fledgling took less than 10 minutes. Delay due to my folly which I deeply regretted. Nonetheless, I’m most delighted that all ended well. Miraculous, indeed! Both the parents and their brood have finally left their nest for good. All dearly missed! FAREWELL, MY SWEET DARLINGS! GROW WELL AND BE SAFE! TO THE PARENTS, I SALUTE YOU WITH FLYING COLORS! My heartfelt prayers have been answered. Thank you so much, Lord God. Parents abandoned nest with their fledglings two days ago, yet one of the parents returned this morning to perch briefly on the hanging pot of orchids which had been its daily stopover for nearly a month. It flew in for a few seconds around 9.30am and returned again an hour later with some feed in its beak, searched for its young briefly before taking off again. Very strange behaviour? Was there a brief moment of memory loss, I wonder? Pray that everything is fine and fledglings are safe! Enjoy a life poster of the birds’ breeding event. Thanks a lot! Happy you have found it interesting! i shared the feelings as the same happened in our garden sometime early last year. it was amazing when you know something good is happening right in your compound. the bulbuls nestled on a mickey mouse plant [a species from africa] which is a source of food for the parents. Hi Nasir! They sure were…sweet, exciting and exhilarating days! You’re so blessed too to have experienced such wonderful wildlife encounters! Isn’t nature absolutely awesome? Thanks for visiting and leaving your kind thoughts. I came across your site quite by accident. I was surfing on bulbuls. You have written a marvelous account of your lovely experiences. I am from Sri Lanka and right now I have a pair of Red Vented Bulbuls with a brood of three lovely chics about to take flight may be even tomorrow. 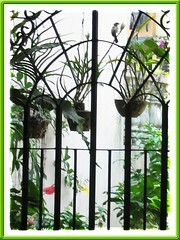 I had purposely done up a little cane basket and fixed it up onto our antique hanging lamp in the front veranda. This is about the third time the couple raised a family in it. I get a fine view of the goings on from my easy chair and binoculars. I will be very sorry when the little ones finally take wing but I am also confident they will very soon come back in a couple of months time to entertain us again once I clean and refurbish their little home for their next arrival. I am very happy to know that there are others like me who are so interested in our little winged friends. Thanks for your kind comment and sharing of your bird-watching experiences too, Neville! Wow, how lovely…your kindness in providing a ‘ready-made’ nest is repeatedly rewarded! Indeed, I can sense your excitement over the current brood. We’re blessed to be able to enjoy these nature events! We had some recent experience of bulbuls’ egg-hatching activities in our garden that went kaput…read about it @ https://www.jaycjayc.com/birdwatching-garden-may10/. All the best for future birding enjoyment! 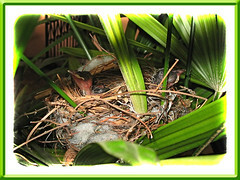 As I anticipated the three little chics took their first flight the very next day early morning. It was a big commotion with mum and dad screaming their heads off at times and darting from place to place coaxing the little one to fly out. Two of them obeyed the commands and came down fluttering on to our veranda. The third took a little time. Soon the two of them were on a Croton plant in the garden. One of them flew down to a very low branch. Then one of the parents did something which I have never seen before. She flew down to the ground, spread its wings out fully and paced about making noises in a circular manner for about 4-5 mts. as if instructing the little chic to fly up again. Is this a normal behavior of Bulbuls I wonder. Could also have been an aggressive behavior since we were watching the whole episode at close quarters. The third one also flew out onto a tree and I think went on to the next garden. Sorry to say I have never seen him after that. The first two was spending their time in our garden for the next couple of days eagerly fed and watched by the parents. It was beautiful to see the two of them all huddled together like two little cotton balls! They were there this morning but alas seem to have gone elsewhere by this evening beyond our sight. However all this was a gorgeous experience never to forget. 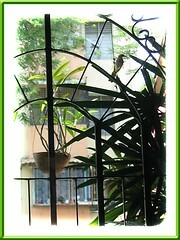 So now we are all sorry to be in a silent veranda without the chirp and the loud cries of our little Bulbul family. Hope we will be rewarded again soon in their refurbished apartment ! What a lovely experience, Neville! Thanks for the wonderful details…it’s as if I’m there watching the whole episode too! Simply delightful! Just to keep you posted Jacq, I was delighted to see the little puff balls again in our garden. They have grown quite a bit., but still under the watchful eyes of mom and dad and of course being fed all the time. They were learning to have a bath in our bird bath ! Being armatures both of them just whetted their back ends and the tails and fluttered and preened. This was just before sun down before their night roost. Bulbuls I think are known to love bathing. How wonderful…I’m green with envy, haha! I’m amazed that the family returned to delight you further, Neville! I remembered our one and only experience recorded above where the whole gang left and never came back. Thanks for the update, I do enjoy reading them. Cool posting, thanks for any info, I’ll make this place a must visit on my daily time wasting :) run. Thanks for your appreciation and kind comment, Ernie! Thank you very much for your kind appreciation and compliment, Bill! It was truly an awesome experience to savour and an unforgettable one…praise God for that wonderful blessing! i came to ur website by chance while i was surfing on bulbuls. Well I must say u have written a very good article on ur amazing experience. 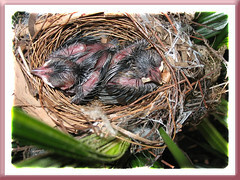 I am from India and rite now a pair of red vented bulbuls in my garden with 2 babies which are 3 days old. though I am not lucky like u coz i dun get to see them coz every time I try d mummy bird came out of nowhere and try to shoo me off so i guess its not good to disturb them. but still its a nice experience having a lovely bird in my garden. and thanx 4 ur article coz through this I came to know many things about their lifecycle. Thanks for your sweet and positive comments, Kanika! Hope you get to enjoy more of such encounters in your garden in future. We do get bulbuls nesting on the same tree every now and then but sadly, their eggs get eaten by a couple of nasty squirrels that frequent our garden for food. After my post in 2010 I have had the privilege of observing my Bulbuls raising their families several times in my purpose built little cane basket. Of late, twice the eggs have failed to hatch after incubation. The last time which was just a few days ago the parents have abandoned the nest with two eggs after two weeks of incubation. I was sad to see this happen. Any idea why the eggs fail to hatch? I also hope to clear it out after a few more days and get the place ready for yet another nesting episode of my favorite Bulbuls. 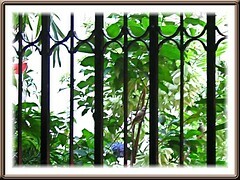 How wonderful for you to watch the remarkable events of bulbuls’ breeding in your garden several times, Nevilole! Re your enquiry, I’m sorry that I’m unable to furnish you with answers to your question. Nature has its ways which is sometimes beyond our comprehension. Anyway, wish you all the best for the next nesting event.